seems like a contradiction. How can a material remain liquid below its freezing point? The phenomenon occurs in pure, undisturbed substances which are slowly cooled below the normal freezing (or melting) point. So long as no atoms or molecules join to form a solid nucleus, the sample remains liquid. Once a solid forms, though, it spreads rapidly through the sample, and another contradiction occurs. The temperature rises rapidly as the latent heat of fusion is released, an effect called recalescence, and a flash of light often is seen. Then the sample cools as it completes the change from liquid to solid. 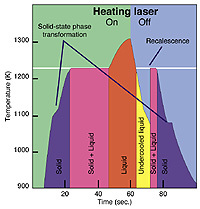 The temperature profile as the sample is heated and cooled (like the example at right), and during recalescence, is important to studies to understand the basic physical properties of different alloys. In a rare number of cases, the metal can be cooled without recrystallizing. Instead, it becomes a "metallic glass" with unique structural and electronic properties. While only a few products are made of metallic glass now, these materials hold great promise for the 21st century. Return to the main ESL story or retrieve print-quality copies of images used in this story.